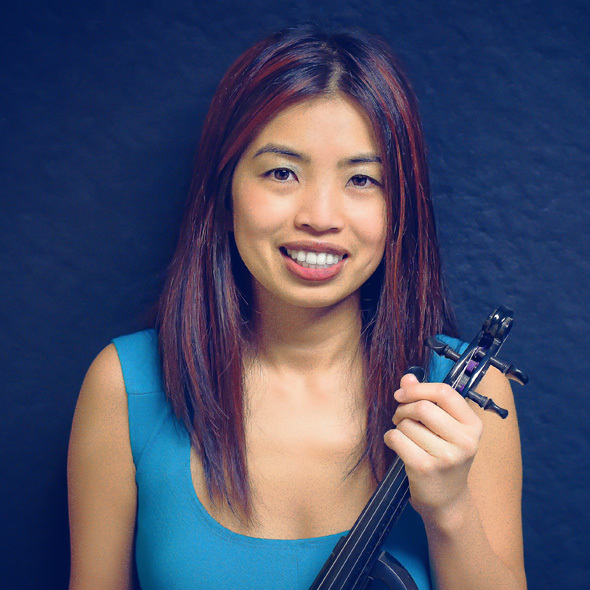 Cindy Su is the owner and instructor at Natomas Music Square (est. 2011), where she shares her lifelong love of music with students of all ages. Adults and children alike enjoy her unique, relaxed piano, viola, and violin lessons, which she’s been teaching for nearly two decades. She began playing piano at age 4 and attended the Taiwan Music Institute for three years before moving to the U.S. She then joined orchestra and took private lessons until age 16. Cindy was an active member of Camilla Symphony for three years. In addition, she’s participated in many musical competitions and received numerous 1st and 2nd place awards for viola. Cindy enjoys music as an outlet of expression and inspiration, and she aspires to help others appreciate and love music the way she has. Her passion is meeting new people and building relationships with her clients. Cindy is also a mom, and her six year old son is currently learning how to play the drum. Cindy’s interests and hobbies outside of music include swimming, cooking, and decorating. Allison has been playing piano and violin for sixteen years. She graduated in 2017 from Sacramento State with her Bachelor's degree in piano performance. She has been teaching private lessons since 2012 and enjoys performing at senior retirement centers as well as conducting beginning and intermediate-level orchestras for the Music Academy at Fremont Presbyterian Church. She also plays for weddings and other special occasions. Whether teaching or performing, she loves music and the way it expresses emotions, offers healing, and brings people together. Soprano Bethany Grace Mamola has charmed audiences with her powerhouse stage presence and warm velvet timbre. The Cleveland Plain Dealer praised her with “...the most beautiful singing, whose Carolina was as disarming in characterization as it was expressive in vocal shading.” The Cleveland Classical said she was “a delight to hear and see. Her casual yet precise stage demeanor and astute vocal talent made for a wonderfully clear vocal interpretation that rang throughout the hall.” Most recently Bethany Grace was seen as Susanna in Le Nozze di Figaro, Drusilla in L’incornazione di Poppea and Zerlina in Don Giovanni with the University of North Texas’ Opera Theatre. She made her debut with the Abilene Philharmonic Orchestra in their Easy To Love—A Celebration of Love Songs from Broadway Gala February 2016. In 2014, Bethany debuted with Cleveland Opera Theatre as the role of Bianca in Puccini’s La Rondine. She also sang Gretel in Hansel und Gretel as a young artist with Nightingale Opera Theatre. Bethany’s other stage credits include Carolina in Il Matrimonio Segreto, La Princesse in L’enfants et les Sortileges, and she covered the title role in Cendrillon with the Cleveland Institute of Music. At the University of the Pacific, she sang the role of Polly Peachum in The Three Penny Opera and Lady Angela in Patience. Bethany was a young artist with Nightingale Opera in Ohio in 2014 and a studio artist with CCM’s Spoleto summer training program in 2010. She won the 2011 Stockton Opera Guild Competition and was the winner of the 2011 UOP Conservatory Concerto Competition. Bethany holds an Master of Music from the Cleveland Institute of Music and a Bachelors from the Pacific Conservatory of Music. She is currently working towards a doctorate at the University of North Texas College of Music. 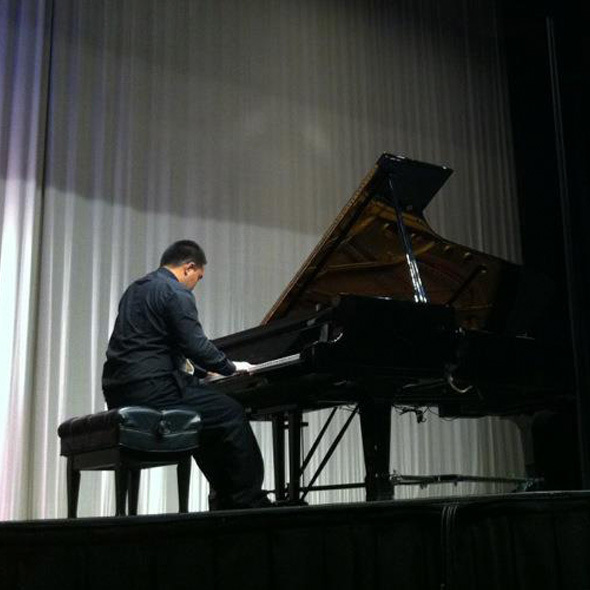 Christian Celis began taking piano lessons at the age of 5. He was classically trained until he reached high school, which is when he got a taste of Jazz. This is when he decided to switch focus and start taking Jazz piano lessons from local music teacher Daryl Howard. He played in his school Jazz Bands and Combos for all four years of high school and continued playing in several Jazz groups at venues in and around Sacramento. He made the decision to pursue a career in music and attended Cosumnes River College for 2 years where he played in the CRC Big Band. Daletza grew up in an artistic family and through her involvement in theatre discovered her interest in music. Her older brother was a guitarist/vocalist/music lover inspired her to pursue music on a serious level. Some of her musical inspirations are Laura Osnes, Dianne Reeves, Aubrey Logan, Johnny Hodges, Jeremy Jordan to name a few. After American River College she would like to become an independent music teacher and continue to expand herself into the professional world of music performance. 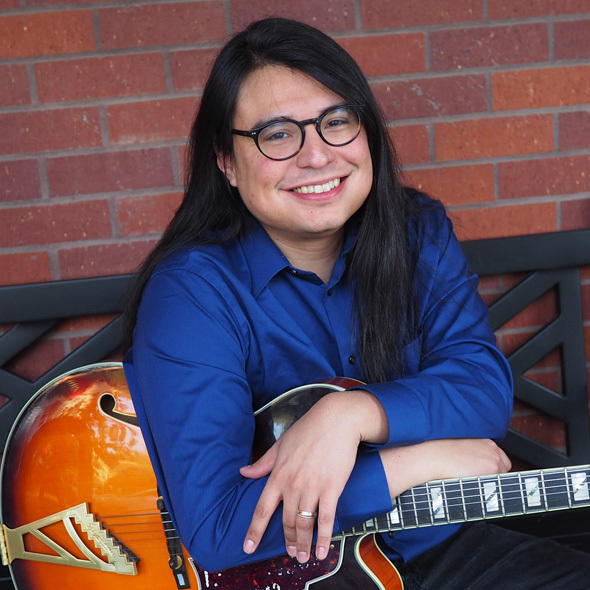 Eddie Roa holds a Bachelors in Music from Sacramento State and has been teaching guitar professionally for over 5 years and playing for over 15 years. He loves working with students of all ages and levels including those with special needs. As a music teacher, Eddie’s goal is to provide students with fun and inspiring lessons that enable quality practice sessions at home. Eddie’s lessons emphasize music fundamentals from the perspective of the individual student’s interests and goals. He loves to teach all styles including rock, pop, blues, jazz, country, folk, and classical. Eddie’s specialties also include songwriting (lyrics and music), improvisation, and composingarranging in popular styles. Erik Stillabower has been playing and performing music for the last 21 years. Starting on the violin in the classical method until leaving high school. Erik has performed in the Fort Wayne Indiana all city Orchestra, Indiana state school music association competitions, and with various artists since starting his musical career. In his teens he began to focus on early jazz and American old-time music learning guitar, bass, banjo, and ukulele along the way. Erik has been teaching for the last 6 years and believes that music should be accessible to all people at any age. No matter what kind of music you want to play Erik will take the time to personalize the lesson to help you get what you want out of your music. Living and teaching music in Pittsburgh, PA for the last 6 years Erik has recently moved to Sacramento with his wife and two dogs (Hank and Hank) So she could start an exciting new career. Fionna has been a student of Cindy for over 10 years. She has taken piano lessons for a majority of those years and is now taking violin lessons. While still a student, Fionna teaches violin and art for young children. She began in 2017 and loves teaching at Natomas Music Square. She enjoys helping young children find their own creativity and expressing it through music and art. Linda Herring received her bachelor’s in vocal performance in 2015 and is currently completing her final project for her master’s at the Sac State School of Music. Linda learned to sing and play piano, went on the road at nineteen and ended up in Nashville where she pursued a recording career. Linda has fronted her own band, been cast in principal roles in opera at Sac State, and performed in Hunchback of Notre Dame at Music Circus in recent years. Due to her varied background, Linda is asked to sing everything from country music and jazz to 20th century classical music. Linda teaches voice and beginning piano at Natomas Music Square. Macey Robles has been playing music for 16 years, beginning as a flute player in the 4th grade. She continued flute and picked up the alto sax, piano, ukulele, and violin throughout high school. She attended Sonoma State University where she received her B.A. in Music Liberal Arts in 2017. During her time in University, she also studied Philosophy and German to eventually teach music abroad over the Summer of 2016. After graduating she began working as a music teacher in the Bay Area, teaching private lessons and small music theory classes. She has since moved back to her hometown of Woodland, where she is continuing to teach music and music theory to kids of all ages. Patrick Hennessey has been playing the drums since the young age of six, when he received his first drum set. He joined the youth orchestra at his grade school as the snare drummer, bass drummer, and timpani player. with different musical styles. It was during this time that he shared stages with artists like Cake, Flogging Molly, Arlo Guthrie, Bob Mould, Jonny Lang, Semisonic, Soul Asylum, The Wallflowers, and The Young Dubliners. Since 2014 he has played with the Irish influenced rock band The Pikeys. His newest project is the eclectic folk trio Rayleigh Scattering. He is also a first call fill in for many bands in Northern California. Ronnie has 12 years of music experience and has performed all around Sacramento. He has studied genres like rock, country, jazz, and traditional classical music. Ronnie currently studies music at Arc with a Jazz Studies Major. Lesson with him will focus on learning how to read rhythms from simple to complex, working on limb independence, keeping good time when playing by yourself or with others, creativity on the drum set, learning different styles of drumming and of course having fun! St. John Fraser started playing the violin at the age of 7. It was his first love. He started off learning violin in the Suzuki method. He then switched over the traditional classical method. He was part of the Saint Louis Youth Symphony for many years. He auditioned and was accepted into the Encore School for Strings. Also he participated in many local and state competitions, auditions, and solo performances. Life happened and he put the violin down for many years. But found his way back to it with his original love of the instrument. Since then he has worked with many different local artists also recording tracks for their projects when requested. He has received positive reviews in Sacramento Magazine, as well as a few other local publications. Since 2012, he has been an integral part of One Eyed Reilly, a regional band that has been very active with over 80+ gigs a year including releasing 3 albums of their own. St. John believes strongly in building good fundamentals so the student has the ability to take their musical experience in whatever direction that they would like. Through experience he has learned that everyone absorbs information differently and at their own pace, so he is happy to teach at the pace that works the best for the pupil. Music is fun, and that is at the core of his teaching philosophy. Violin is a beautiful instrument and worth taking the time to learn and enjoy playing it. Stephen Pocus is a jazz pianist, composer, arranger, and teacher who brings his infectious enthusiasm into the teaching arena. Before the age of 16, Stephen was recognized as a gifted musician and became the pianist for the San Jose All Star Youth Jazz Ensemble as well as the San Jose Youth Latin Jazz Ensemble. At the age of 16 Stephen graduated high school and began performing with various groups in the Bay Area while teaching Jazz and Concert band classes at Buchser Middle School in Santa Clara Stephen was awarded a full scholarship to attend The Jazz Institute in Berkeley, CA studying under Susan Mascarella and Marcos Silva. While attending, he performed at various venues including the Boom Boom Room, The Sheba Lounge, Yoshi’s in Oakland, and Yoshi’s in San Francisco. Upon finishing his two years at the Jazz Institute, Stephen moved to Brooklyn New York, where he played in many of the local Jazz clubs in Brooklyn and Manhattan and studied with the legendary Barry Harris. Susan Levine is a music major at CSU Sacramento, with a focus in Clarinet Performance and Music Education. She grew her musical life in the Roseville School District. She is currently conducting and directing ensembles such as the Sacramento Youth Symphony, and the Sacramento Youth Band. Susan also specializes in woodwinds and piano. 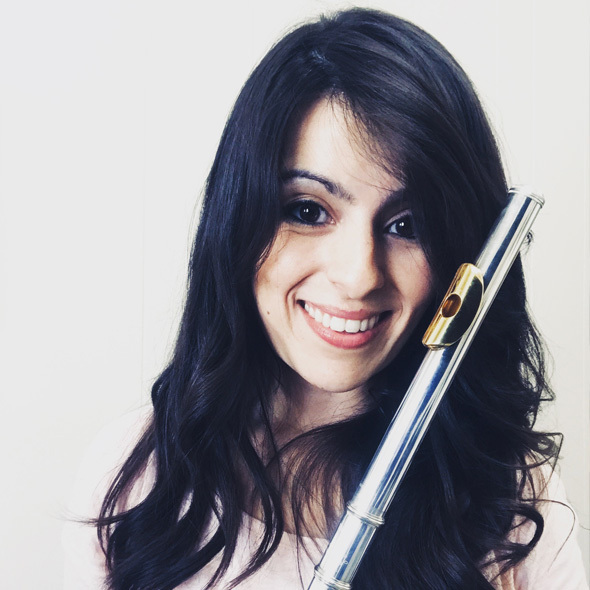 She teaches at multiple elementary schools in the Elk Grove and Sacramento areas, and clinics for the woodwind sections of several local high schools. 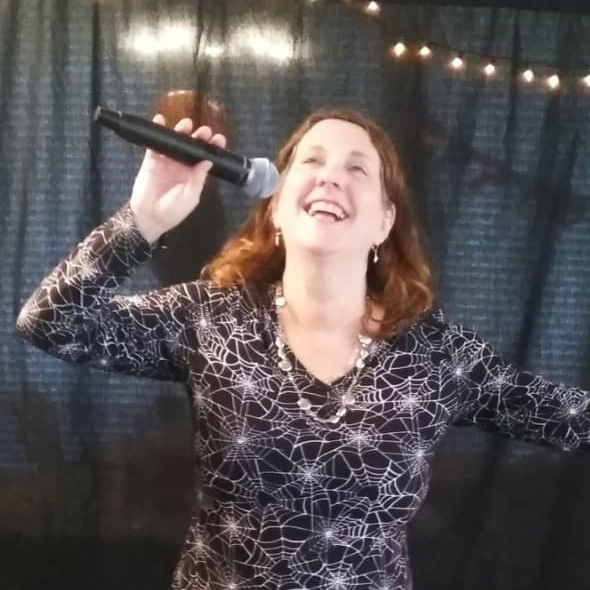 As a performer, Susan plays in local pit orchestras for musicals, orchestras, and live music in Roseville, Sacramento, Fairfield, and Stockton.